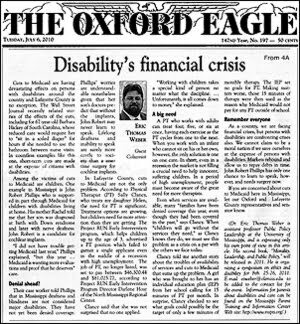 Here is the article I wrote for July 6's Oxford Eagle, "Disability's Financial Crisis." You can read a scan of the original article in Adobe PDF form here. Note in the last paragraph/bio blurb that I've listed the dates for a symposium I'm organizing on ethics and disability. If you can attend, I hope you will. It promises to be a wonderful event. I'll post more information closer to the event as more specifics become available. The organization which I'm planning this symposium is the Society of Philosophers in America (SOPHIA), which you can learn more about here: http://www.philosophersinamerica.com. Cuts to Medicaid are having devastating effects on persons with disabilities around the country and Lafayette County is no exception. The Wall Street Journal recently related stories of the effects of the cuts, including for 67 year old Barbara Hickey of SC, whose reduced care would require her to “sit in a soiled diaper” for hours if she needed to use the bathroom between nurse visits. In countless examples like this one, short-term cuts are made at the expense of citizens with disabilities. Among the victims of cuts to Medicaid are children. One example in Mississippi is John Robert Phillips who is supported in part through Medicaid for children with disabilities living at home. His mother Rachel told me that her son was diagnosed at birth with Down syndrome and later with nerve deafness. John Robert is a candidate for cochlear implants. “I did not have trouble getting Medicaid last year,” Phillips explained, “but this year … Medicaid is wanting more evaluations and proof that he deserves” care. Their case worker told Phillips that in Mississippi deafness and blindness are not considered major disabilities. They have not yet been denied coverage. Phillips’ worries are understandable nonetheless given that her son’s doctors predict that without the implants, John Robert may never learn to speak. Lifelong deafness and inability to speak are surely more costly to society than a one-time surgery for cochlear implants. In Lafayette County, cuts to Medicaid are not the only problem. According to Physical Therapist (PT) Sally Clancy, who treats my daughter Helen, the need for PT is significant. Treatment options are growing, but children need far more attention than they are getting. The Project RUN Early Intervention program, which helps children up to the age of three, advertised a PT position which failed to garner a single applicant even in the middle of a recession with high unemployment. The job of PT, no longer listed, was set to pay between $46,300.44 and $81,025.77, according to Project RUN Early Intervention Program Director Darlene Hoar of the North Mississippi Regional Center. Clancy said that she was not surprised that no one applied. “Working with children takes a special kind of person no matter what the discipline… Unfortunately, it all comes down to money,” she explained. A PT who works with adults can treat four, five, or six at once, having each exercise as the PT cycles from one to the next. When you work with an infant who cannot sit on his or her own, however, the only solution is one on one care. In short, even in a recession the market is not filling a crucial need to help innocent, suffering children. In a period of high unemployment, people must become aware of the great need for more therapists. Even when services are available, many “families have been denied coverage this year, even though they had been covered in the past,” says Clancy. When “children will go without the services they need,” as Clancy knows they do, we must see this problem as a crisis on a par with the others we face today. Clancy told me another story about the troubles of availability of services and cuts to Medicaid that sums up the problem. A girl who was brought to her has an individual education plan (IEP) from her school calling for 15 minutes of PT per month. In surprise, Clancy checked to see what goals could possibly be the target of only a few minutes of monthly therapy. The IEP set no goals for PT. Making matters worse, those 15 minutes of therapy were then used as the reason why Medicaid would not pay for any PT outside of school. As a country we are facing financial crises, but persons with disabilities are confronting crises also. We cannot claim to be a moral nation if we save ourselves at the expense of persons with disabilities. Markets rebound and allow us to repay debts in time. John Robert Phillips has only one chance to learn to speak, however, and needs surgery now. If you are concerned about cuts to Medicaid here in Mississippi, let our Oxford and Lafayette county representatives and senator know. Dr. Eric Thomas Weber is assistant professor Public Policy Leadership at the University of Mississippi and is expressing only his own point of view in this article. His second book, Morality, Leadership, and Public Policy will be released in 2011. He is organizing a symposium on ethics and disability for February 25–26, 2011. Email etweber@olemiss.edu to be added to the contact list for the event. Information for parents about disabilities and care can be found on the Mississippi Parent Training and Information Center Web site: http://www.mspti.org/. To make it easier, here are their numbers: MS House Rep. Noal Akins: 662-236-2473, MS House Rep. Tommy Reynolds: 662-473-2571, MS State Senator Gray Tollison: 662-234-7070. I don't know Change.org well, but the piece they've put together for it on my new project is a nice little summary of what I'm working on regarding poverty and education in Mississippi. The article here may or may not stay up - such is the world of internet writing. It seems there is quite a demand for people to think about how to address the problems of poverty and educational failure, though. This little article is one of about 7 or so times the same kind of short review has been written on the work I'm doing. I think it's great to get the word out. Maybe it will help as I make my case to the funding agencies for the project. I'll keep you posted.